In 2007 Norman Doidge wrote the bestseller The Brain that changes itself. With this book he introduced the topic of neuroplasticity to the general public. Neurploasticity is the capacity of the brain to keep developing and reorganizing itself. We have that capacity from cradle to grave. In that interesting book Doidge described the work by pioneers in the field of neuroplasticity such as Michael Merzenich, Paul Bach-y-Rita, and Barbara Arrowsmith Young. 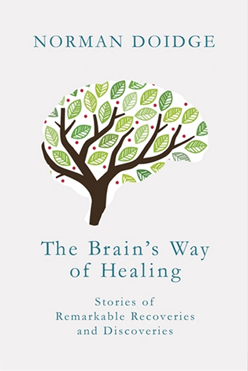 Now there is the successor of that book called The brain’s way of healing. Although the book was only published a few days ago, before I had a chance to read it I had already seen a rather negative review in an English newspaper. According to the reviewer Doidge would not been afflicted by false modesty by calling his book the turning point in the history of brain science. Also, he would make exaggerated claims about neuroplasticity. Furthermore, his explanations would not be factual enough and his book "part of a contemporary stampede towards the moralisation of medicine: patients are encouraged to blame themselves for their sufferings, and to think that their chances of recovery depend not on random tricks of fate, or the luck or good judgment of their doctors, but on their own willpower and moral fibre." Now that I have read the book I am surprised by these criticisms. At no point in the book I found Doidge's tone immodest. And, indeed, his first book was very influential by introducing neuroplasticity to a large audience. But, in my perception, he did not portray himself as the hero of that new paradigm. Instead, he introduces other people, the pioneers of the field of neuroplasticity. They are the book's heroes. And are Doidge's claims exaggerated? Well, which claims, then? The things presented in both book appear very surprising and sound sometimes unbelievable. But the descriptions of the phenomena are actually rather factual and specific as far as he mechanisms are already clear (in some cases they aren't). Doidge's approach is nuanced and seems realistic. He does not create false hopes in my view. Also, throughout the book, he cites many scientific studies which support many aspects of the approaches mentioned in the book. When I had finished Doidge's first book, I admit, I was reluctant to believe some of the specific descriptions in the book. That is how unbelievable they sometimes seemed (can you really teach a blind man to see with his tongue?) But I have read a lot since then, and I have seen documentaries which were quite convincing and my reluctance is gone. I can imagine that to everybody is enthusiastic about this type of book. I am a strong advocate of skepticism. But skepticism does not mean that new and surprising ideas should not be taken seriously. Instead, it means that you research serious claims with an open and critical mindset. There are more than enough reasons to take Doidge's books seriously. These reasons are not only based on anecdotal examples but also on research. Some highlights of the new book I found a chapter about how chronic pain may be unlearned, a chapter about man with Parkinson's disease who found relieve by walking, a chapter about healing effects of laser technology, and a chapter about the healing effect of increasing awareness of micro-movements. All in all I think this book is worthy successor to The brain that changes itself. It is well written and contains a great deal of new and intersting information.